Five years down the line with two albums and multiple tours in Europe to show for their efforts, Owiny Sigoma Band unravelled their third album Nyanza in August 2015. The first two singles off Nyanza, namely Changaa Attack and Luo Land, immediately hit all the right spots as expected from the genre-bending nyatiti/electronic+ soundclash. The band has now released a music video to the third single I Made You,You Made Me and a short documentary highlighting the creative process and the experiences of the band while recording the new album. Unlike the recording of their self-titled debut or Power Punch done in the urban hustle and bustle of Nairobi and London, the band preferred the more serene settings of the rasta-run Jah Mic Studio and a rented house in Kisumu by the shores of Lake Victoria to record the new album. 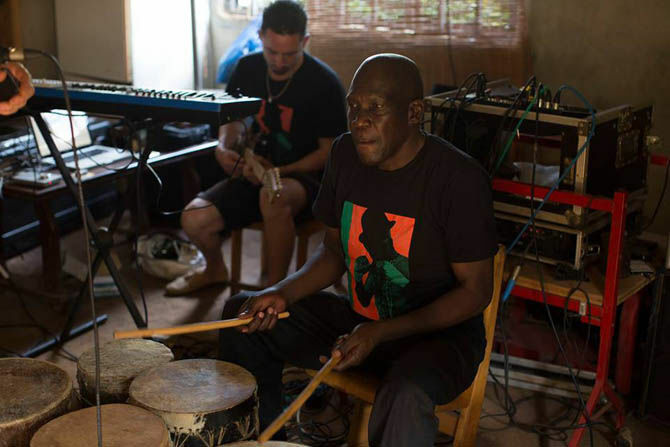 This change in location gave the band’s UK-based members – Jesse Hackett, Louis Hackett and Tom Skinner – a chance to learn from and experience traditional Luo music right on home soil while chaperoned by the Kenyan half consisting of Joseph Nyamungu and Charles Owoko. Their sessions as depicted in the film are full of the kind of moments you’d expect of an adventure up in Western Kenya – everything from getting a taste of chang’aa, sitting through rain and power blackouts, stumbling upon some Legio Maria faithful on a pilgrimage in the rocky hills of Kajulu and a lot of spontaneous bits of inspiration from the sights and sounds that added to the flavour of the album itself. We get an insight into the origins of Joseph’s musical career from a family lineage of nyatiti players. There is more where that talent came from as well. Their concert at Joseph and Charles’ home village in Siaya turns into a 12 hour romp as the visitors are treated to an extreme battle of two local nyatiti bands. The documentary reveals a band that is way past the stage of symbiosis and now gradually dealing with the joys of synthesis. Both sides of the musical, cultural and geographical divide do not just learn from one another, they have come to give each other the level of trust one gives to family. Such a level of trust and honesty is probably what makes the band willing to expand their sound across all sorts of genres. The documentary follows the overarching theme of the album – placing a bit more emphasis on the Kenyan/Luo side of their soundclash and try to bring out the Luoland that the band experienced in during their recording sessions and concerts. In Luoland, just like in any other African setting, the musical gift is not just a component of genetics and the everyday abilities of humankind, it is a spiritual thing. The ability to belt out a tune or play an instrument is more importantly the ability to bring people closer to their ancestors and closer to God. With its limited duration, the documentary communicate this message well through its nuances. That being said, it’s time to listen to the album.